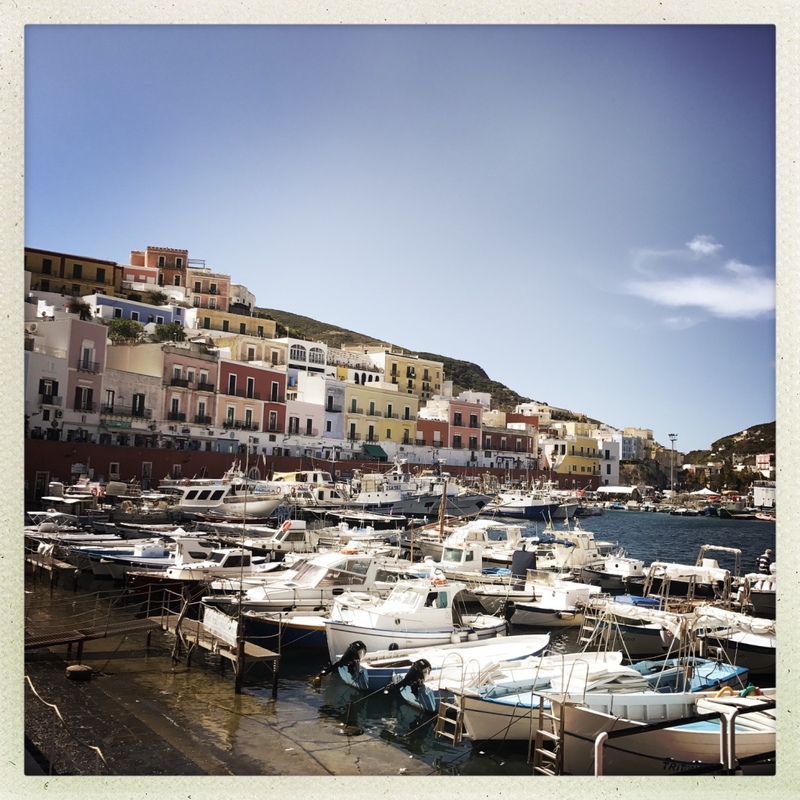 When we booked our tickets for a week in Rome, we weren’t planning a visit to Ponza. We love Rome. A week there was enticing already. Still, I kept remembering our September holiday in Minorca two years ago, and began dreaming of another island holiday. 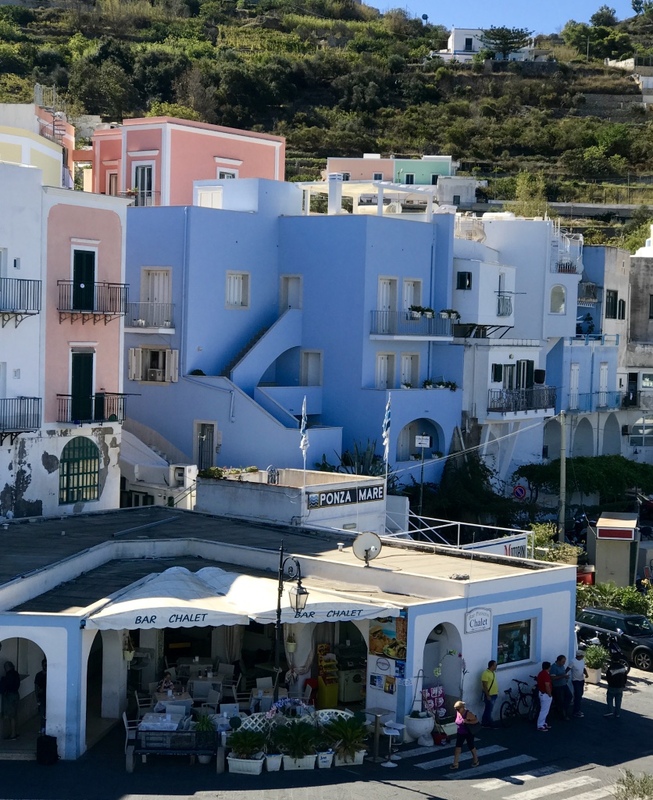 When I found a charming Airbnb studio apartment right in the main port of Ponza at about $100 a night including all fees, Jim said, “Andiamo!” Our trip transformed into three nights in Ponza and four nights in Rome. If you go in September, be sure to check the ferry schedules in advance as they are cut dramatically after the high season. Much of the island closes in October and reopens in April for the Easter weekend. Our research found that the best train-to-ferry connections were in Anzio or Formia. Anzio is closer to Rome but in late September only Formia had an afternoon ferry that worked for us. 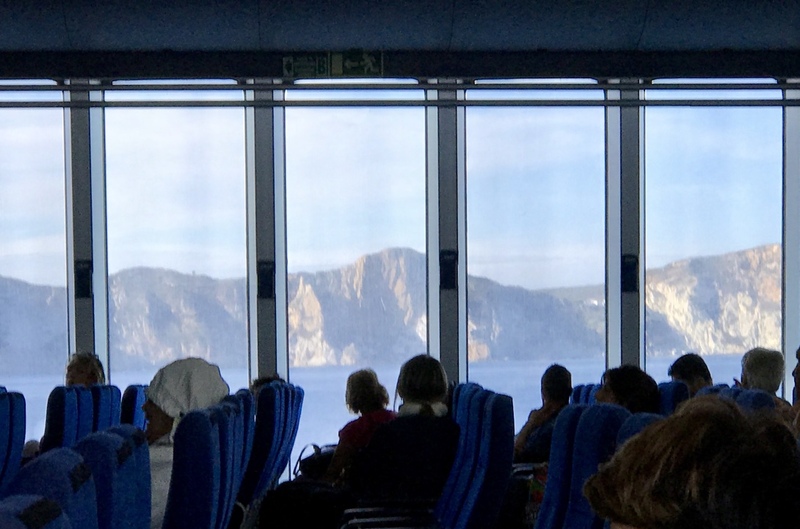 We flew from New York to Rome, connected in Rome for a train to Formia, and just caught the last ferry for Ponza, with really tight connections. 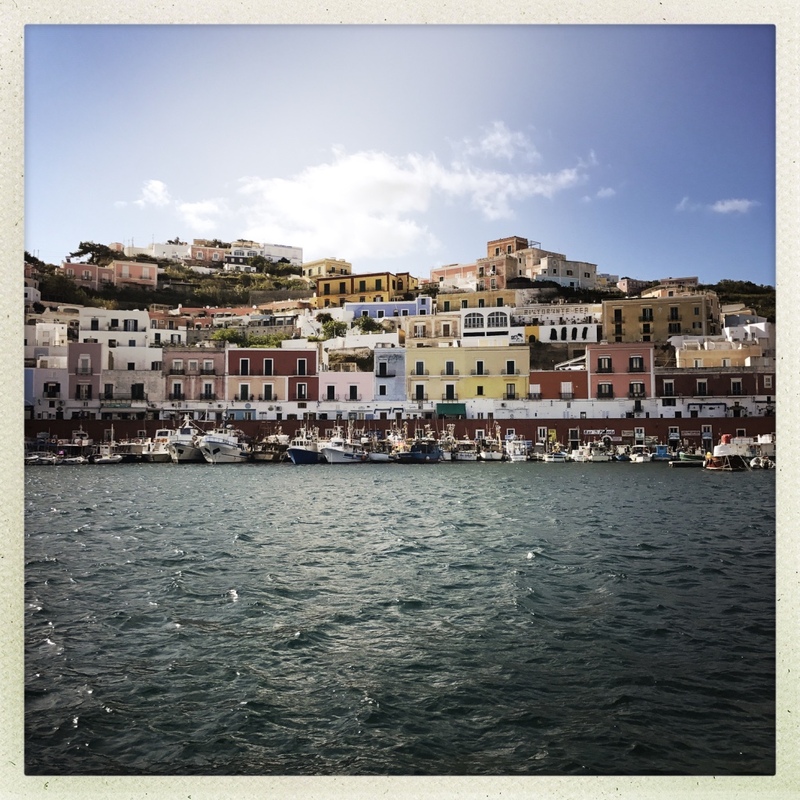 The travel gods were with us, and we arrived in Ponza in the gorgeous light of a late afternoon. Ponza is the largest of the Pontine islands in the Tyrrhenian sea, 5.5 miles in length. September or ’shoulder season,’ as I’ve heard it called, is a beautiful time to visit Ponza. The island is renowned for its spectacular walking trails, and without the blazing summer heat, the walks are truly a pleasure. The local merchants seemed happy to see a few more tourists before they have to close for the season. Our Airbnb is called the Villa Marisa. It’s so close to the ferry that we went too far and had to circle back to the port again. If you go there, it’s literally right in front of you when you leave the ferry, a pretty blue building behind the Esso station. 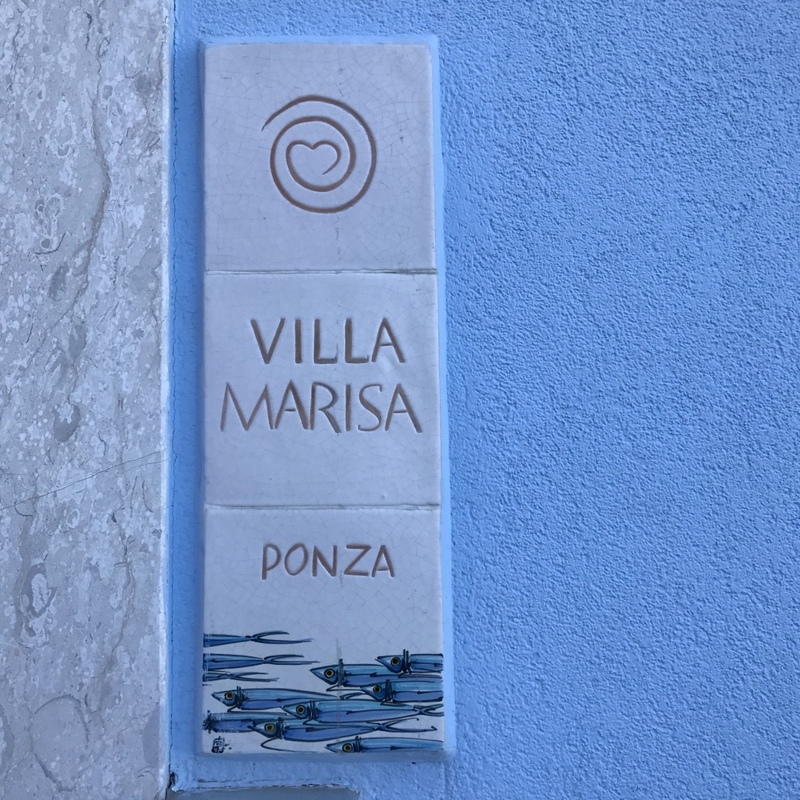 We very much enjoyed it: the Villa Marisa is simply furnished in a maritime theme, and we loved the outdoor patio overlooking the port. 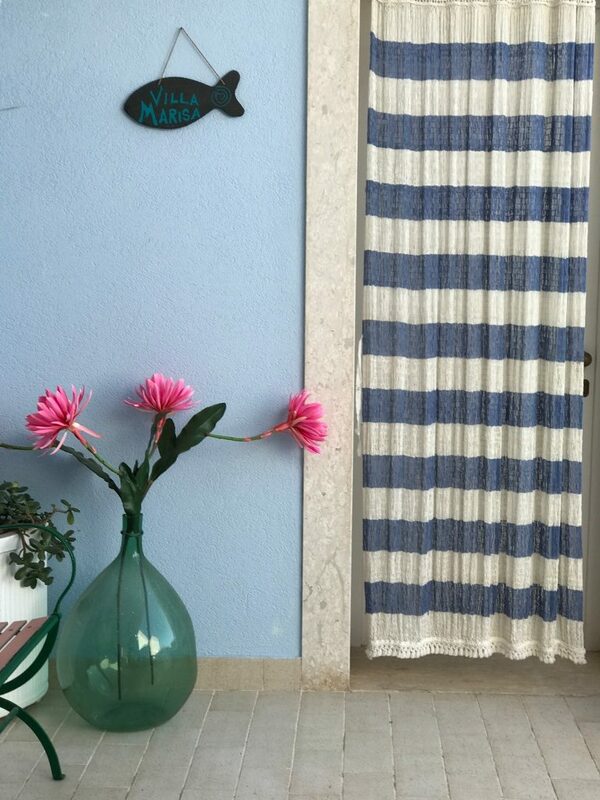 It is just steps away from some of Ponza’s best boutique shopping on the Corso Carlo Pisacane. The first night of our visit, we were awakened by continuous lightning, soon joined by thunder and winds that had the boats in the port straining at their moorings. The island has been experiencing a drought, so the night rain was welcome to the Ponzesi people. The stiff breeze kept up the next day, keeping the boats in the port—even the water taxi that takes tourists over to the main Frontone beach. On our morning walk along the port, we saw teams of boat crews looking forlorn. The winds kept them from working some of the last days of the season. The waters of Ponza are beautiful shades of turquoise and cerulean blue. 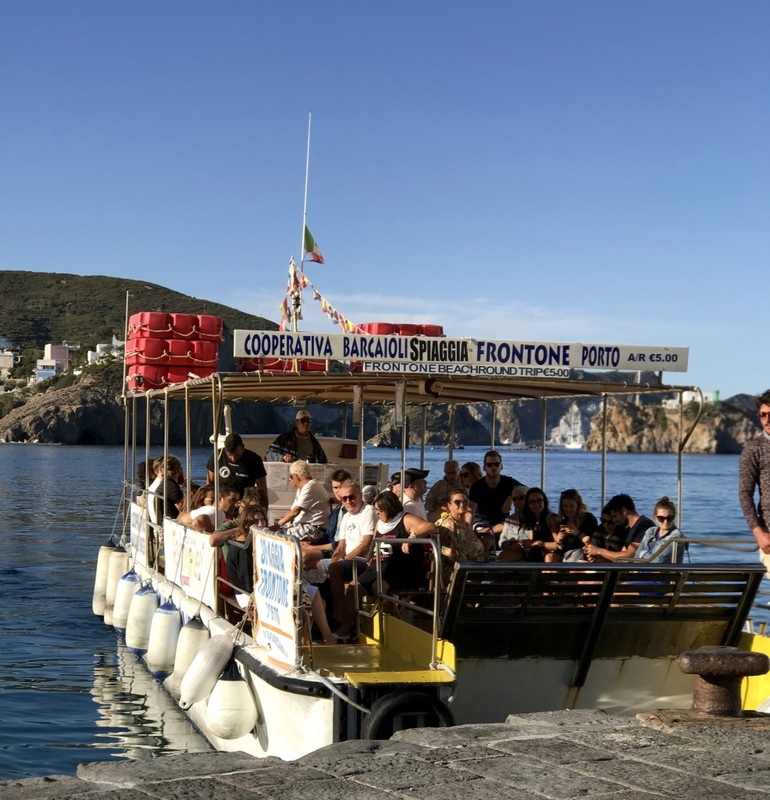 It’s no wonder the main advice when visiting Ponza is rent a private motor boat or take a boat tour from the port and drop anchor in one of the pristine blue coves for a day of sunning and snorkeling. The island is equally beautiful by land. 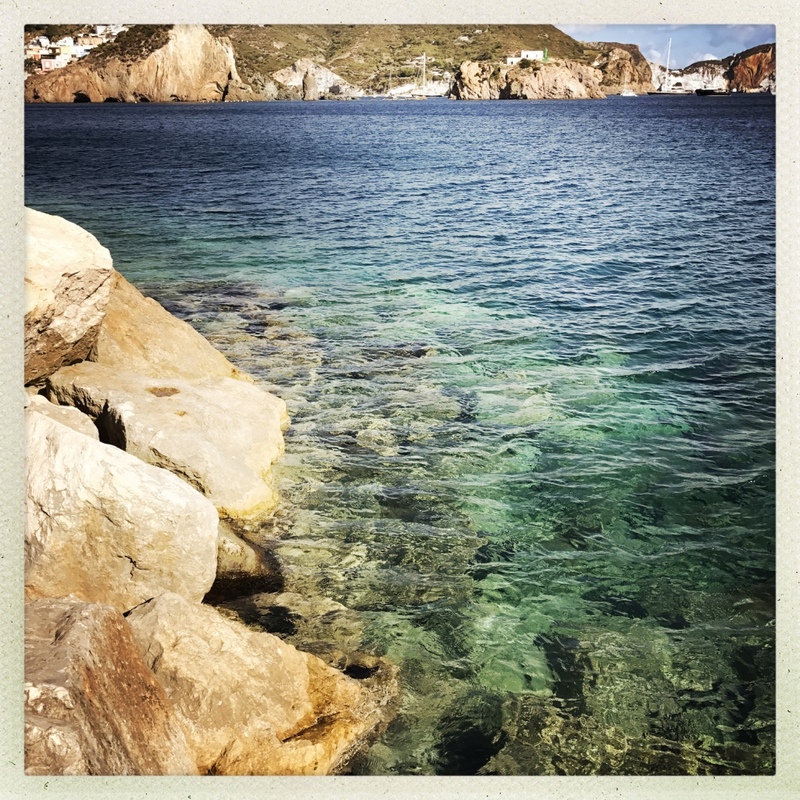 We walked up from the port toward the church on the hill, reading the signposts on the way about the archaeological significance of Ponza landmarks. Wealthy Roman families vacationed there in Roman and Etruscan times, looking to escape the heat. 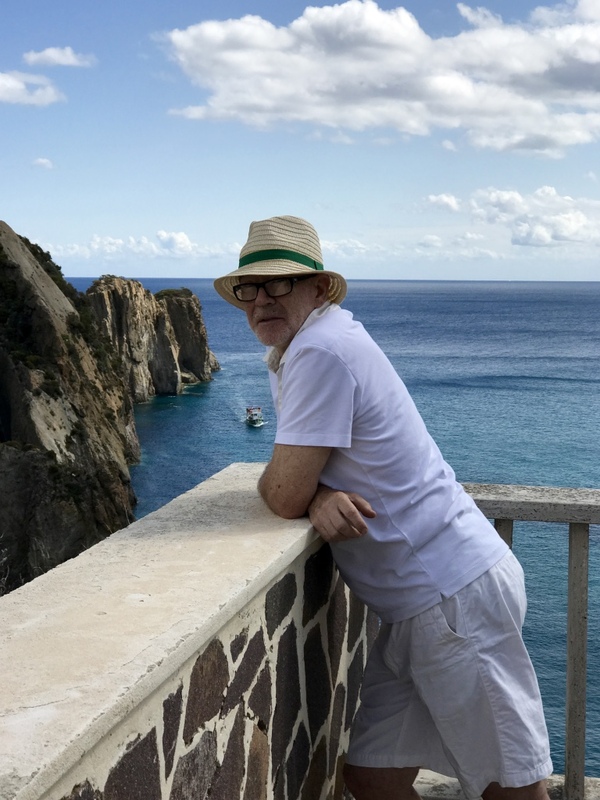 As we went up the hill, we found several secluded small hotels — including Villa Laetitia, Anna Fendi’s small, luxurious bed and breakfast– and a stunning view of the sea. We kept walking up, eventually stopping in the Ristorante Arcobaleno for a leisurely lunch of pasta and local roasted fish. We took a few hours here, on an outdoor terrace overlooking the marvelous view. We climbed even higher on narrow stone streets that soon became hiking trails. We passed vineyards, terraces of fig, olive trees, wild blackberries. 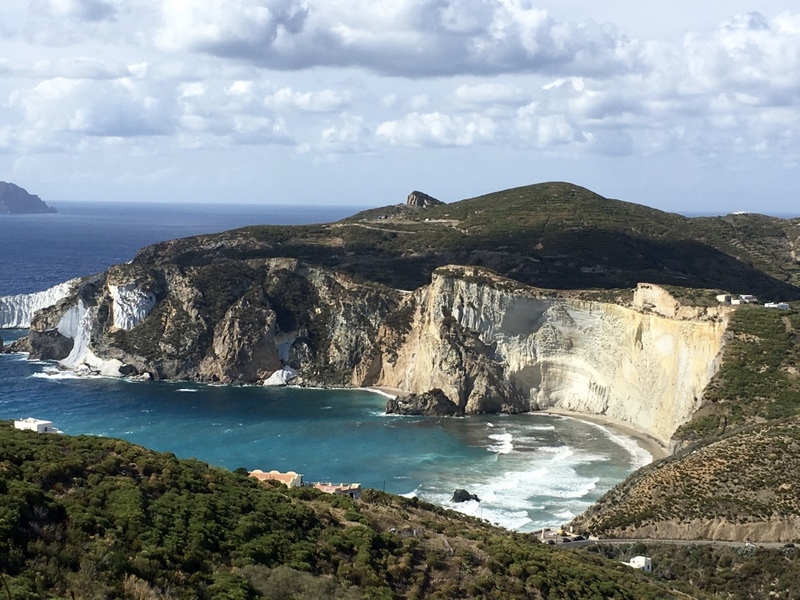 Without too much of a taxing hike—taxing enough after wine and lunch—we were suddenly looking down on dramatic cliffs of the Chaia de Luna beach. 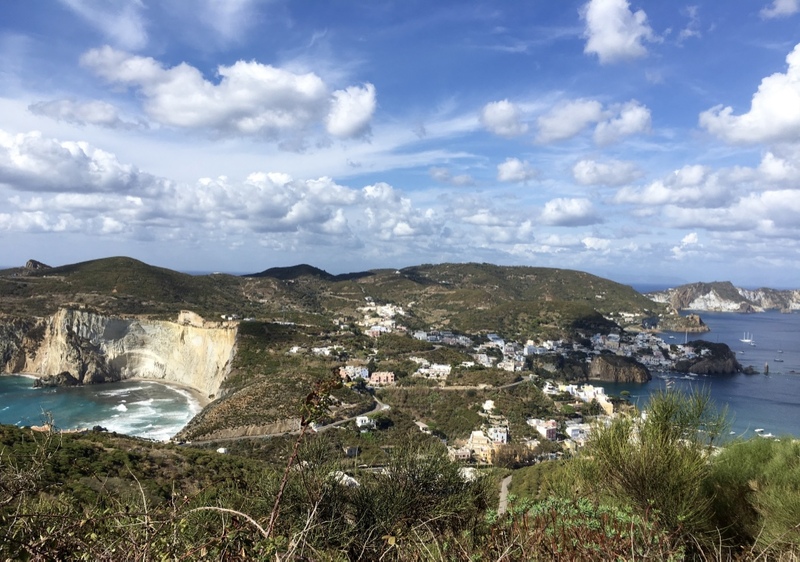 The island is only about a mile and a half across at the widest point, so from near the top, where we were, you can see it all: the port of Ponza on one side and the beautiful Chaia di Luna beach on the other side. We turned around when we met the burro. He was friendly, but we were ready for a respite. Jim made a plan to come back the next morning so he could explore the other side of the island. The next day, the breeze was even stiffer. Again, the boats were not going out. Jim left early for his hike, and I had a great morning of shopping. All of the shops listed below are on the Corso Carlo Piscacane, which is an easy pedestrian shopping street that runs from one side of the port to the other. 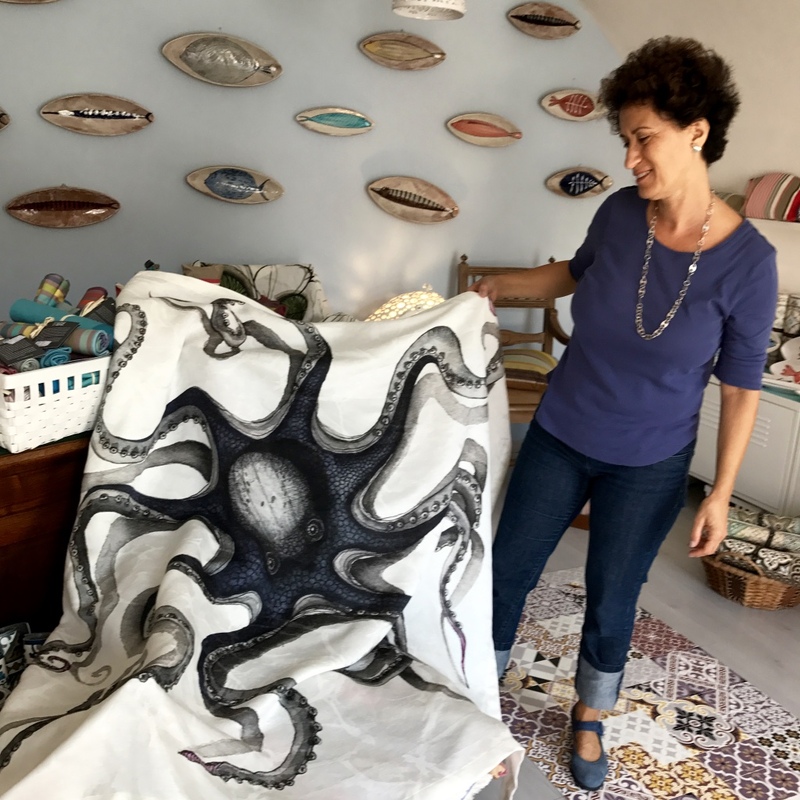 Some of the most sophisticated housewares I found at Le Cose di Mari, where the very charming Angela showed me fish platters and lamps, along with block printed Italian textiles, tablecloths, totes, and more. Angela runs this lovely boutique while her husband Luigi oversees the nearby Hotel di Mare. 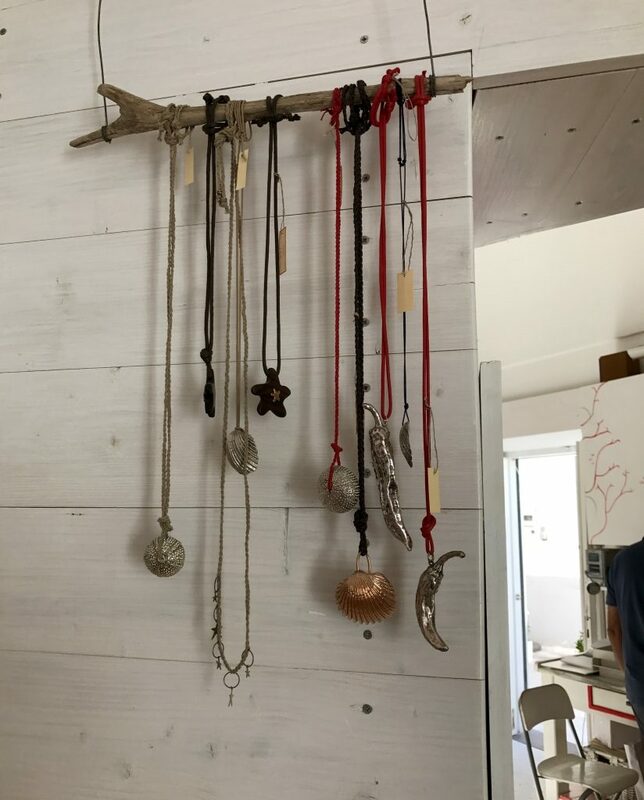 There were so many wonderful pieces, I could have spent hundreds of euros at Angela’s shop, and at Casa Corallo where I bought a tiny bronze octopus pendant. Alessandra Ravenna designs delicate sea creatures in cast metals and carved coral. She is a Roman who worked with Tiffany and Mikimoto in her days living in New York City. Ten years ago, she moved to Ponza with her husband Fabio who runs the shop. 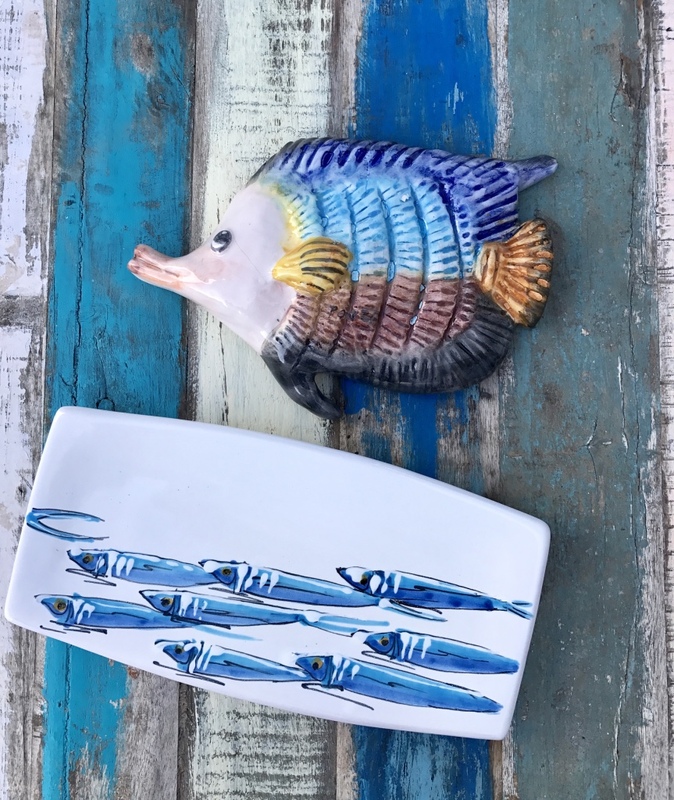 I also bought lovely ceramics made on Ponza by Guglielmo Tirendi and Italian textiles at a La Porta del Sole, a shop offering fine Italian textiles and housewares and adorable Italian children’s clothing. Jim came back raving about the beauty of his three-hour hike, and the friendly dog that accompanied him for the whole hike. 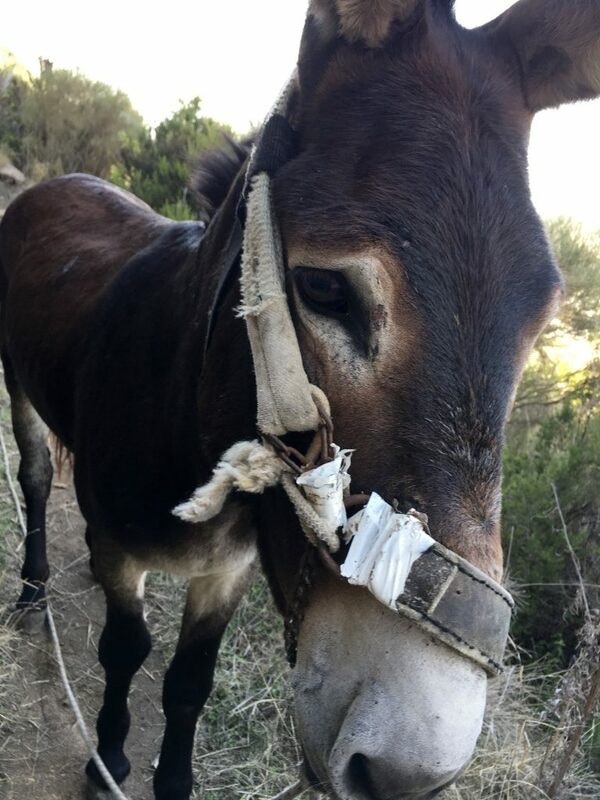 He continued past where we saw the burro, following the trail to the terraced hills of the Antiche Cantine Migliaccio, a vineyard whose wines we enjoyed during our stay. Then he switched back and went to another trail toward Monte Guardia and the ruins of the old lighthouse, the highest point of all Ponza. He saw a herd of goats sunning themselves on the rocks on the steep seaside cliff. He had such a good time that he already wants to go back. In late September, it was clear the season was winding down. The Ponzesi people are ready to close up their businesses and go on their own holidays. The butcher and his wife told us they are going off to Portugal soon. Maria Rita, who runs Le Porta del Sole, said she is looking forward to a late winter trip to New York City. On the third day, the winds had calmed and the boats were again leaving for the turquoise coves of Ponza and Palmarola. We, too, were getting ready to go out on the water, but sadly it was time for us to go: our boat trip was on the ferry taking us to Rome for urban adventures. 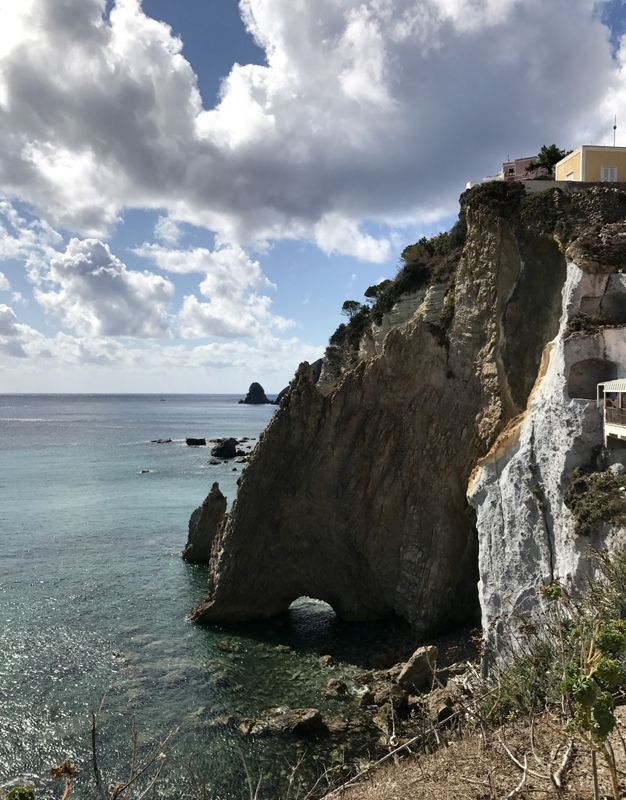 Next time we will stay longer in Ponza, so we can explore the azure coves, beaches and grottoes. This time, we are grateful to have enjoyed splendid meals, wonderful shopping, invigorating hikes, and the cool sunny weather. 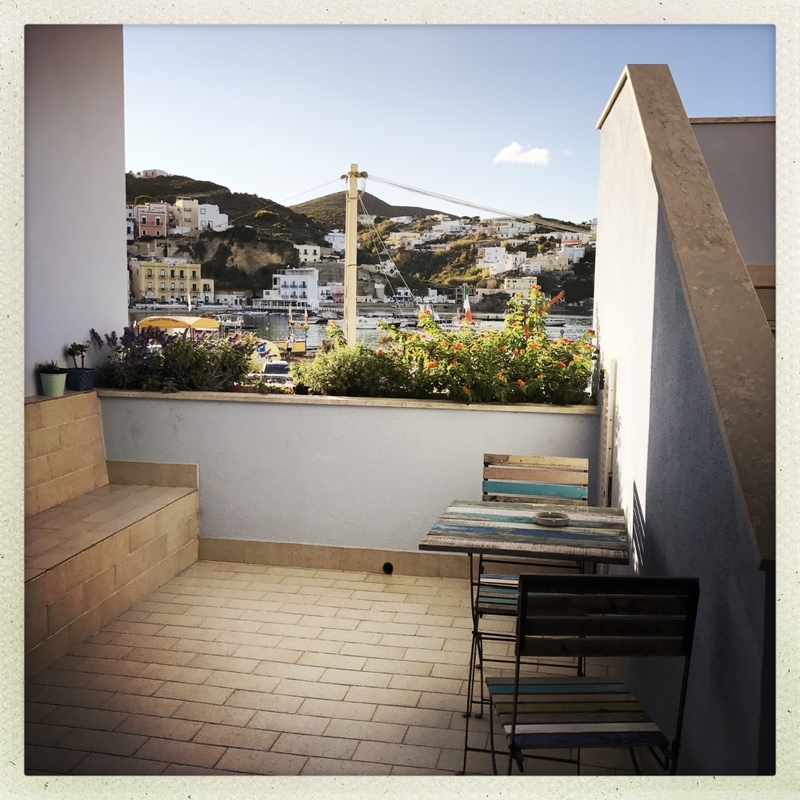 If we ever go in high season, it’s likely we’ll appreciate even more our September holiday in Ponza. Thank you Candi, for giving us your Ponza tips. What a beautiful island! We can’t wait to return. 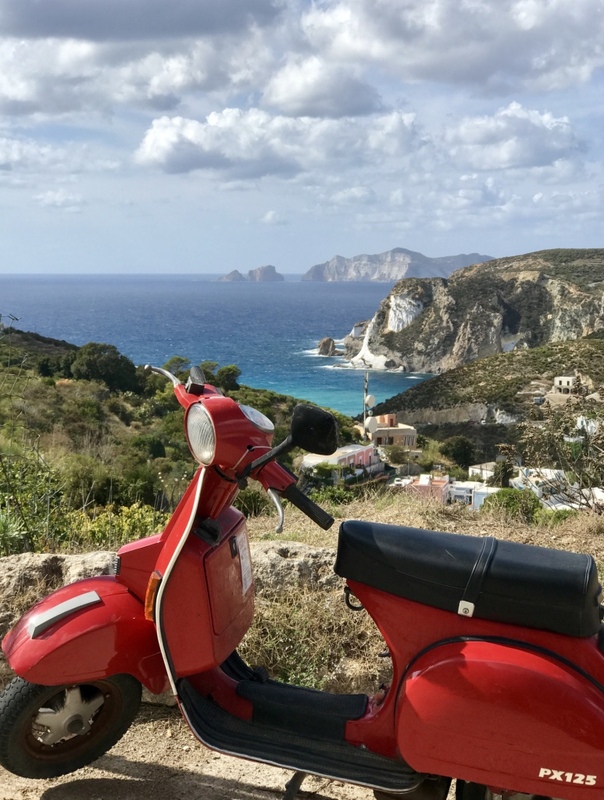 I cannot wait to visit Ponza after reading your post. I am definitely adding it to my travel list! Thank you, Gemma. You will absolutely love it! Grazie Mary,io parlo un po di Inglese ma non so scriverlo, non tutti i negozi chiudono,io rimango aperto per fare la produzione dei souvenirs per l’anno venturo perciò rimango aperto tutto l’inverno aspettando Pasqua, grazie per essere stata nel mio negozio e per avermi menzionato nel tuo post. Thank you. Noted that your shop won’t be closing this winter. We bought several pieces in your shop and love them. 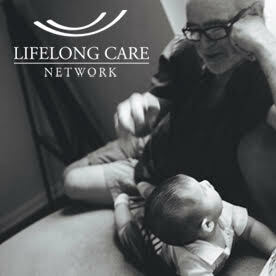 We look forward to getting more on our next visit. Thanks so much, Emanuela. See you next year! Yes indeed. And I’ll certainly bring home a treasure from your shop on the next visit. I love my octopus in bronze! So lovely Mary ! I can’t wait to visit someday! Ponza looks so beautiful! This made me want to visit there someday! Thanks, Tara. Check the Airbnb listings when you do. There are many nice and affordable options. Beautiful pictures! I especially love the soft pastel colors of the buildings – so pretty! I have yet to explore much of Italy and this makes me want to go there….one day!